Other books have been written about clergy misconduct and its effects on congregations. Some are by victims. Others are written by professionals for a professional audience. Until now, however, there hasn't been a book for the congregational leaders who must deal with the fallout of prior clergy misconduct. This collection is for the "afterpastors" - interim or settled pastors - who follow misconducting pastors. And it's for lay leaders who may themselves have witnessed or been victimized by the misconducting pastor. Both groups of leaders need guidance about how to assess and effectively respond to the misconduct, how to care for the victim/survivor, and how to carry out the mission and ministry to which the congregation has been called. 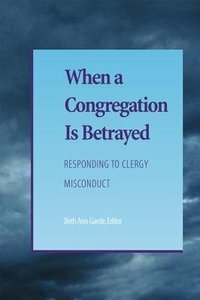 About "When a Congregation is Betrayed"
Beth Ann Gaede is a pastor of the Evangelical Lutheran Church in America and an editorial consultant to the Alban Institute. Alban publications she has edited include Ending with Hope: A Resource for Closing Congregations (2002) and When a Congregation is Betrayed: Responding to Clergy Misconduct (2006).